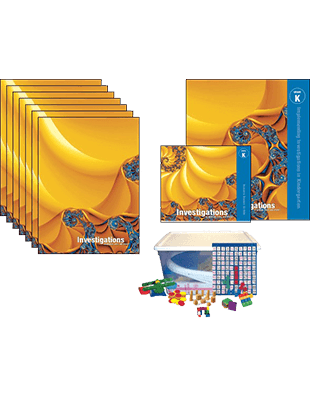 This grade level package includes all Curriculum Units (Teacher's Editions), the Implementing Investigations guide, the Differentiation and Intervention Guide, CD-ROMs of Resource Masters, and Transparencies. These practical grade-level guides help teachers get started with the program and provide useful, ongoing support information. This engaging resource highlights major mathematical words and ideas for students and provides directions for games to use in class or at home. Provide students with recording sheets, game directions, homework, and daily practice pages with this consumable workbook. One book contains all pages for all units. All students love to play games! Capture their interest and connect it seamlessly to practicing math facts through the Investigations math games they play in your classroom or at home. Compatible with any mathematics program. A valuable resource for all classrooms including Title 1 classrooms, After-school Programs, School Volunteers, Boys and Girls Clubs, and even Parents to use at home! Promote practice in computational fluency in class or at home. Compatible with any mathematics program. Manipulative Kits and interactive whiteboard games are also available.